2000 should have been the natural end of the BabyBoomer-led economic SuperCycle. The oldest Boomer (born in 1946) was about to leave the Wealth Creator 25 – 54 age group that drives consumer spending and hence economic growth. And since 1970, Boomer women’s fertility rates had been below replacement level (2.1 babies/woman). So relatively fewer young people were joining the Wealth Creator generation to replace the Boomers who were leaving. But instead, central banks decided that demographics didn’t matter. They believed instead that monetary policy could effectively “print babies” and create sustainable demand. So instead of worrying about financial stability – their real role – they aimed to stimulate the economy by boosting financial asset prices – primarily shares and housing markets. But instead, when the Subprime Bubble burst, policymakers did even more stimulus via Quantitative Easing (QE). The end of the ‘London is a global city’ myth. The house price/earnings ratio averaged 4.8x between 1971-1999. But it then took off into the stratosphere to reach 11x today, as the myth grew that Londoners weren’t relevant to the housing market. Instead, it was said that London had become a “global city” where foreigners would set the price. Chinese and Asian buyers boosted this myth as vast new apartment blocks were sold off-plan in the main Asian cities – often to buyers who never even visited their new “home”. But the myth ended last year when China introduced severe capital controls – capital outflows collapsed from $640bn in 2016 to just $60bn in 2017. “The total number of unsold luxury new-build homes, which are rarely advertised at less than £1m, has now hit a record high of 3,000 units, as the rich overseas investors they were built for turn their backs on the UK due to Brexit uncertainty and the hike in stamp duty on second homes…. The end of the buy-to-let mania. Parents of students going away to college began this trend in the mid-1990s, as they bought properties for their children to use, rather than rent from poor quality landlords. After the dotcom crash, many decided that “bricks and mortar” were a safer bet than shares, especially with the major tax breaks available. Interest rates will never rise. Of course, the key to the Subprime and QE Bubbles was the Bank’s decision to collapse interest rates to stimulate the economy. Monthly payments became much more affordable – and ever-rising prices meant there was no longer any need to worry about repaying the capital. All “good things” come to an end, of course. And the London property bubble is probably no exception. Its 3 key drivers are now all reversing, and there seems little sign of any new factors that might help to keep the bubble inflating. The risk is that interest rates continue to rise, forcing many owners to sell and bursting the Stimulus Bubble. UK 10-year rates have already trebled from their 0.5% low in Q3 2016. Most rates seem likely to go much higher now the 30-year downtrend has been broken, as I discussed last week. Today’s high prices will also make it difficult for sellers to find local buyers, as the number of homes being bought/ sold each year has fallen 25% since the 2007 peak. Most young people cannot afford to buy. And if many people do decide to sell, potential buyers might panic, causing the slump to continue for many years – as happened before 2000. Nobody knows how low prices might go, if they start to fall. But ‘reversion to mean’ is usually the best measure. If this happened, today’s average London home, selling at 4.8x earnings, would cost £193k – a 60% fall from 2017’s average price of £475k. This figure also highlights the risk that policymakers’ denial of demographic realities has created. The post London house prices risk perfect storm as interest rates rise appeared first on Chemicals & The Economy. The Greater London region is also quite out of line with the rest of England, as the chart above shows – presented by Merryn Somerset Webb at this year’s MoneyWeek conference. Everywhere else apart from Brighton (effectively now a London suburb), has seen prices either fall or remain stable in inflation-adjusted terms. Prices in the northern half of the country are down by 20% or more. “The Nine Elms area is particularly prone to speculative buyers: It’s a dog-basket of developers all whacking stuff up, all jam-packed against each other, and walking out of the door and trying to find a pint of milk is really hard. Looking at what’s coming out of the ground, I wouldn’t want to live there and not many people we talk to want to buy down there. History, as American author Mark Twain noted, may not exactly repeat but it does rhyme. Anyone who still thinks London property might still be worth buying has been warned. It is hard to understand why anyone pays any attention to these excuses. It is, after all, more than 6 years since the financial crisis began. If policymaker’s stimulus policies were going to work, they would have worked by now. The reality is that the US has an aging population, as does most parts of the world. One simple fact explains how yesterday’s demographic dividend has become today’s demographic deficit. As the above chart shows, there are now more people over 65 in the world than aged under 5. In 1950, by comparison, there were 3x as many under-5s. Key for the US economy is the lack of babies to replace the declining demand of the ageing BabyBoomers. But for some reason best known to themselves, policymakers simply refuse to accept this could impact economic performance. Yet consumption is more than 2/3rds of the US economy. Would we rather have growth, or live for an extra 20 years compared to our grandparents? I often ask this question at conferences, and the voting is always unanimous in favour of living longer, as one would expect. Hopefully one day, this simple message will get through to policymakers. I fear, however, they prefer to be willfully blind to its implications for the economy. ‘Nothing succeeds like excess’. That seems to be the motto of London property developers at the moment. According to researchers LonRes, developers are currently building or planning the staggering total of 54000 new luxury homes in central London. These will all be offered at prices of £1m ($1.5m) and higher, according to the Financial Times. Yet just 3900 homes were sold in this price bracket in central London in 2014. So who is going to buy the vast supply of new homes? It certainly isn’t Londoners. I highlighted the record level of London house prices relative to average earnings last March. Then, first time buyers were paying 7.5x average earnings for an apartment, just topping the previous 2007 peak. And relative to median earnings, London property was also at a record 10x multiple. 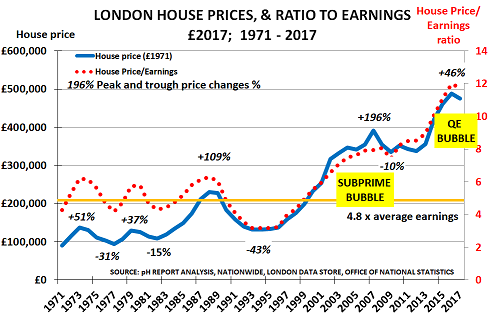 One major concern is that nobody now remembers that London prices fell by a third in the 3 years between 1989-92, and by more than 40% in real terms (adjusted for inflation). 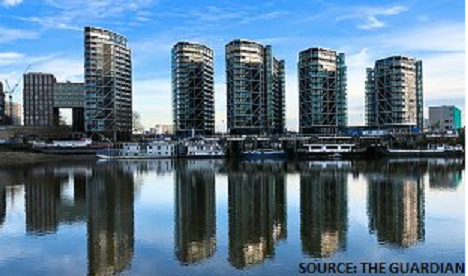 Most younger and foreign buyers instead believe that “London prices can never fall”. But the problem, as Minsky would have reminded them, is that someone has to be able to repay the capital cost at some point. And if the capital can’t be repaid, as is clearly the case in London today, the buyers will simply default. The question is only one of timing. Last year, I thought the bubble seemed capable of continuing to expand. But today, with prices now so much higher, I fear the end is not too far away. The combination of higher prices, falling sales, and increased supply usually means a market is close to collapse. Plus, there is a real sign of desperation creeping into the estate agents’ literature. Vauxhall is home to my beloved Surrey County Cricket Club. And I can understand an agent describing it as “up-and-coming” – clearly this could be true of almost any area. But those responsible for selling the St George’s Wharf development have taken hyperbole to a new level in describing it as “prime central London“. This is the first time I have ever heard somewhere on the wrong side of the River Thames being described this way. Anyone thinking of paying £2m – £4m for its 2-bedroomed apartments might first want to check its location on a map. Maybe there are 54000 millionaires, or people who can borrow millions, already rushing to buy these new properties. But more likely, growing awareness of this excess supply will prove the factor that brings the market back to its senses.